According to tradional Chinese history, the first rulers of China were the "Three Sovereigns." Fuxi, the "Ox Tamer." is said to have ruled from 2852 BC. He domescicated animals, gave people nets for hunting and fishing, music and musical instruments, the Eight Trigrams of divination, and the means to calculate time and distance. Shennong, the "Divine Farmer" invented the plow and hoe, and created the first markets. 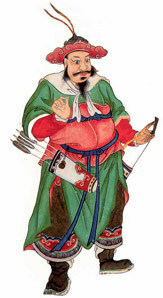 Huangdi, the "Yellow Emporer" is credited with introducing warfare and defeating "barbarians" to establish the Chinese homeland in the Yellow river plain, and he is also said to have invented wooden houses, silk, cloth, boats, carts, ceramics, and writing, as well as the state sacrificial cult and the 60-year Chinese calendar cycle.